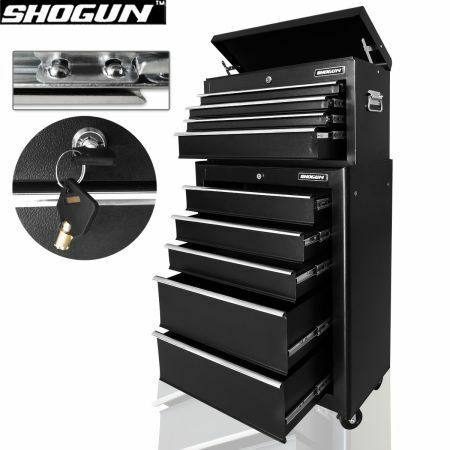 This 9 Drawer Lockable Roller Cabinet Tool Box keeps all your tools at hand and organised. Keep your tools close by and organised with this roller tool box Cabinet. 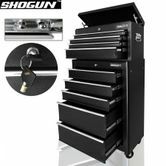 Black in colour with a convenient handle and two compartments for storage, this tool chest will be an asset to your garage. The top of the tool box has a removable tool chest compartment of its own, with a handle on each side so you can take it anywhere! The lower chest is on wheels allowing you to push it wherever you need. With a powder coating finish, this trolley tool box is perfect for the rough and gruff. Whether storing your tools, parts or accessories, you'll find heaps of space to house them all safely. The heavy duty design makes it ideal for car engine repair, painting, carpentry work or just hobby work. The tool box has easy to manoeuvre swivel caster wheels and durable metal supports with 9 drawers. Don't just throw your tools or leave them lying around anymore. Keep them all organised, safe and easily accessible with this Lockable Roller Cabinet Tool Box. Overall with Wheels:61cm x 33cm x 109cm approx. Upper Chest: 60cm x 26cm x 34cm approx. Lower Chest: 61.5cm x 33cm x 84cm approx. 68cm x 32cm x 44cm (Box 1) approx. 69cm x 41cm x 84cm (Box 2)approx. This was just what my husband needed to be more organised. We could have bought a better quality one but less drawers and more expensive. It wasnt in perfect condition but still functional so hes happy enough.